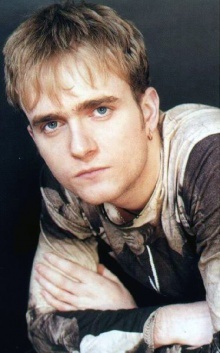 Steven William "Stove" King (born 8 January 1974 in Ellesmere Port, Cheshire. Having formed Mansun with Paul Draper, with whom he shared an interest in graphic design. His first bass was an Aria Pro, which he bought to rehearse with Draper – the pair would play along to drum loops in their bedrooms. Having not picked up an instrument prior to the formation of Mansun, King went on to become a solid bass player, with Bassist Magazine commenting in 1997 that despite being a relative newcomer to the instrument and being self-deprecating in interviews, "Stove and Mansun drummer Andie Rathbone have formed a pretty solid bond in the rhythm department". After he took up lessons in playing the bass before Mansun, he became a solid bass player for the band and took a commanding stage presence, but he did struggle with playing bass in the recording studio. His parts were often subbed out to Dom or Paul. Stove also became a pivotal member of Mansun in terms of promoting the band. At one point, he operated the Mansaphone - an answerphone dedicated to Mansun. The phone number to which was printed on all the band's releases) installed in his house to update fans on news and also receive messages from them. He along with some of the other band members would listen to fans messages and often reply by phoning them back and talking to fans directly. Something unheard of by any other band. Has has been rumoured to have raced in Speedway events, at one point worked in Deeside for a large car manufacturing plant, and supposedly lived overseas. It's not known if Steve has worked on any musical projects since his departure from the band or still plays bass guitar. ↑ Mansun Gallery (2001-05-09). Retrieved from mansun.co.uk. ↑ findmypast.co.uk. Retrieved from findmypast.co.uk. ↑ About Mansun. Retrieved from web.archive.org. This page was last modified on 8 March 2016, at 00:44.